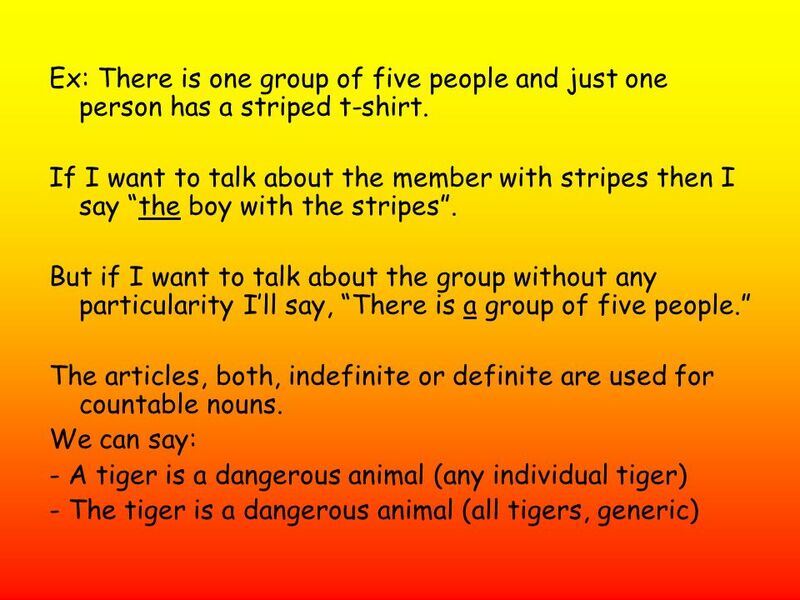 3 Ex: There is one group of five people and just one person has a striped t-shirt. 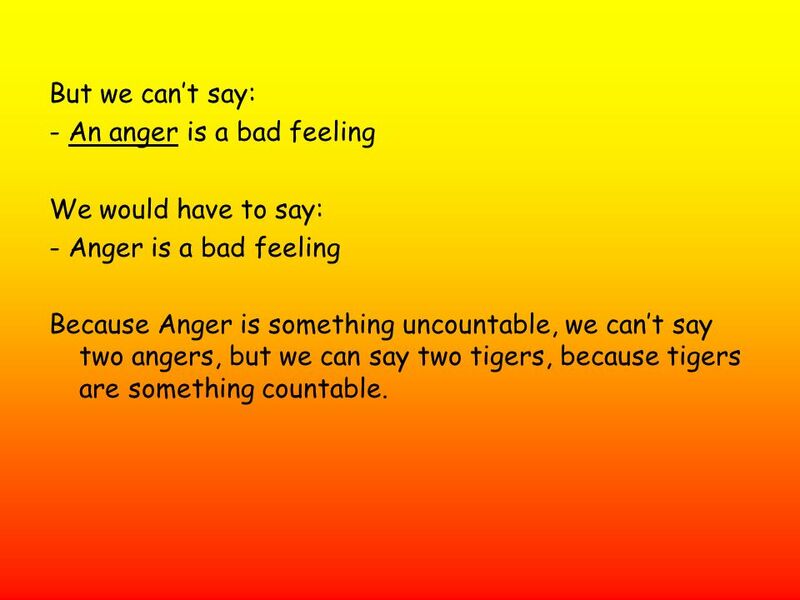 4 But we can’t say: - An anger is a bad feeling We would have to say: - Anger is a bad feeling Because Anger is something uncountable, we can’t say two angers, but we can say two tigers, because tigers are something countable. 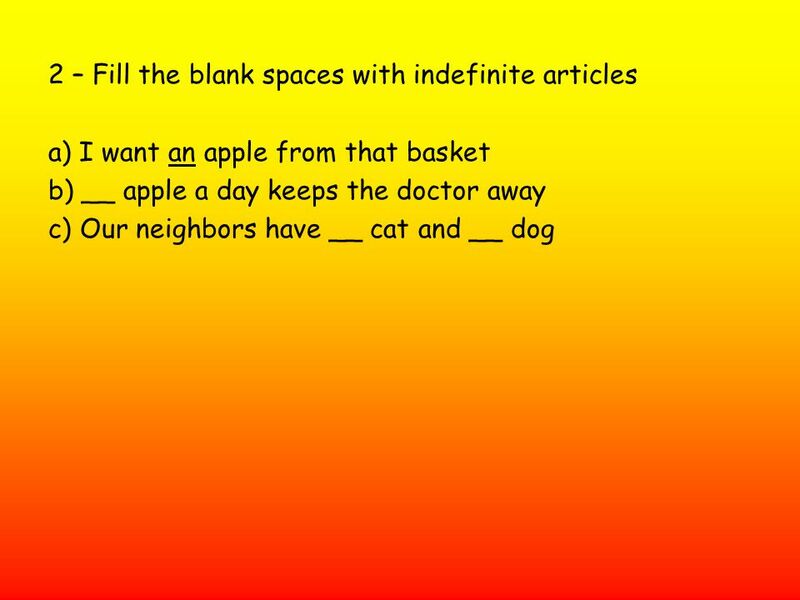 5 Using the articles When we speak, we say sentences that are formed with a noun, verb, articles (definite or indefinite), etc… even if we don’t realize it, we do say the articles. Mostly in simple sentences like “the bottle had a message”, in the example, both types of articles were used, definite and indefinite. 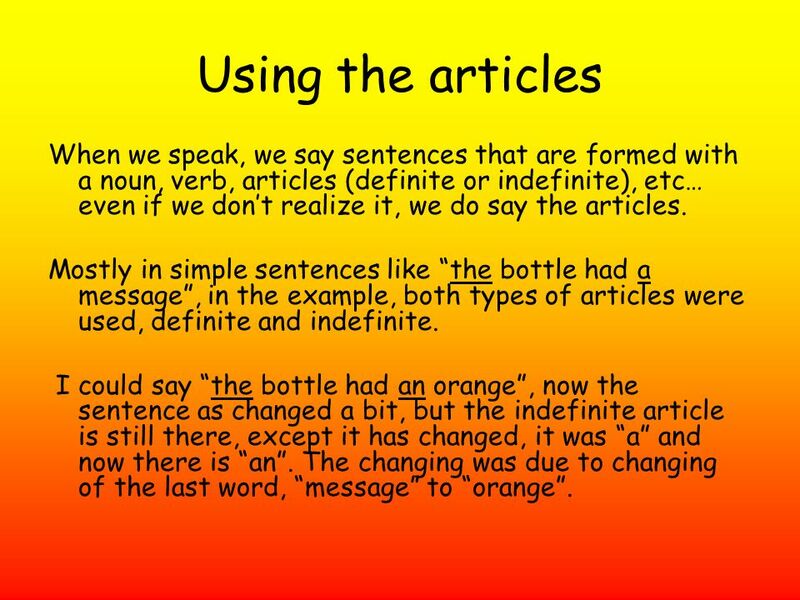 I could say “the bottle had an orange”, now the sentence as changed a bit, but the indefinite article is still there, except it has changed, it was “a” and now there is “an”. The changing was due to changing of the last word, “message” to “orange”. 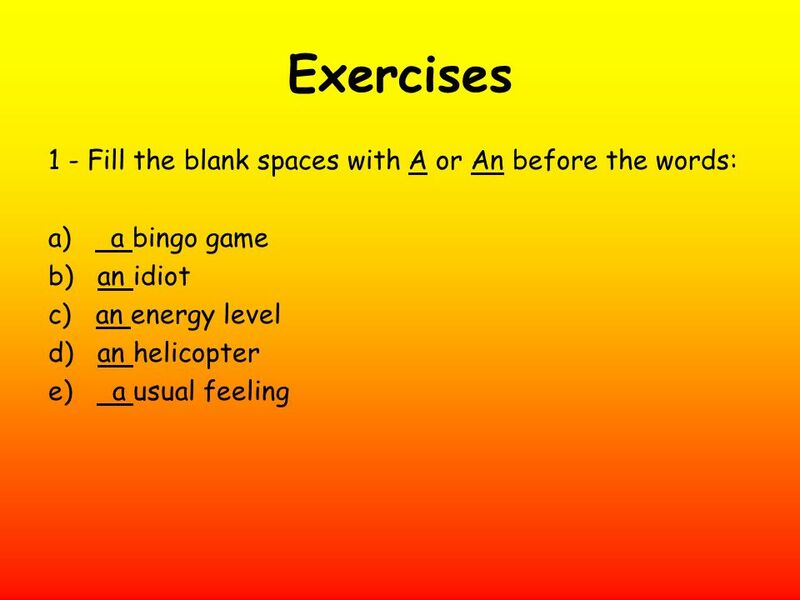 6 Although, the indefinite articles have some exceptions! In the first sentence, the word that comes after the indefinite article starts with a consonant and in the second sentence it starts with a vowel. 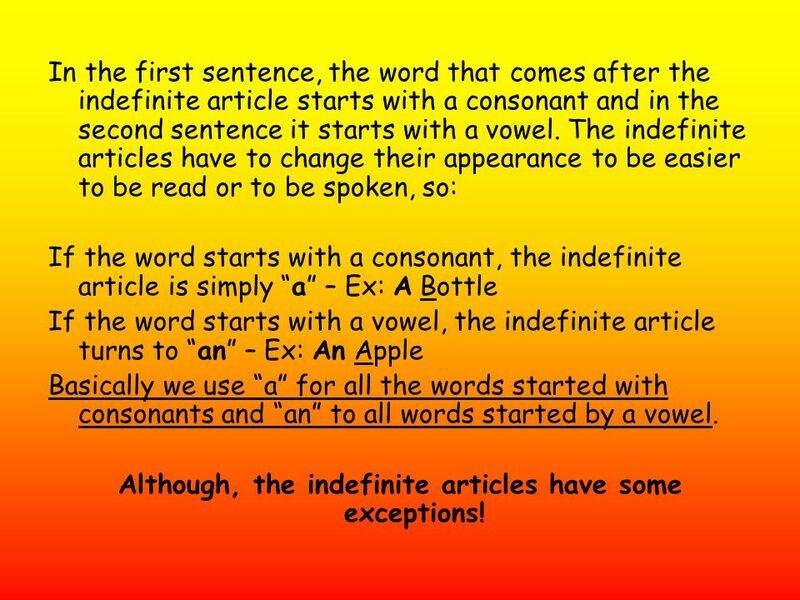 The indefinite articles have to change their appearance to be easier to be read or to be spoken, so: If the word starts with a consonant, the indefinite article is simply “a” – Ex: A Bottle If the word starts with a vowel, the indefinite article turns to “an” – Ex: An Apple Basically we use “a” for all the words started with consonants and “an” to all words started by a vowel. 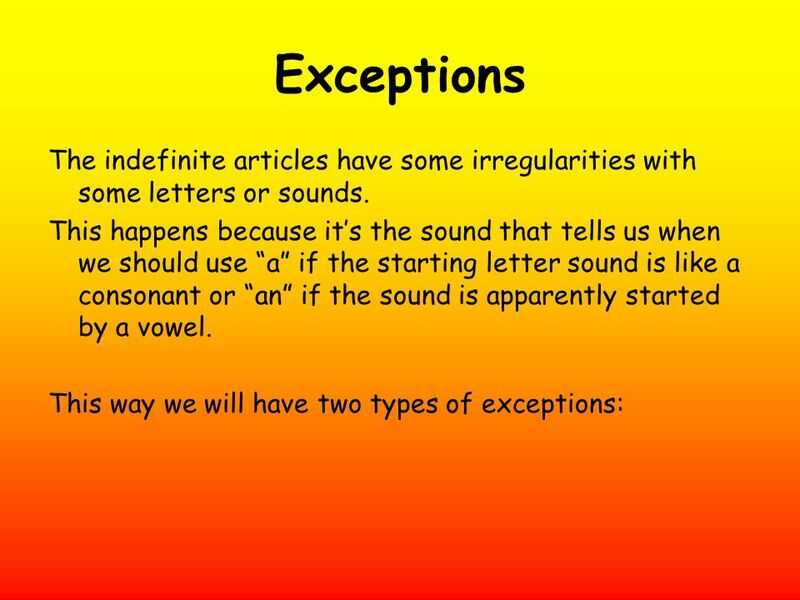 Although, the indefinite articles have some exceptions! 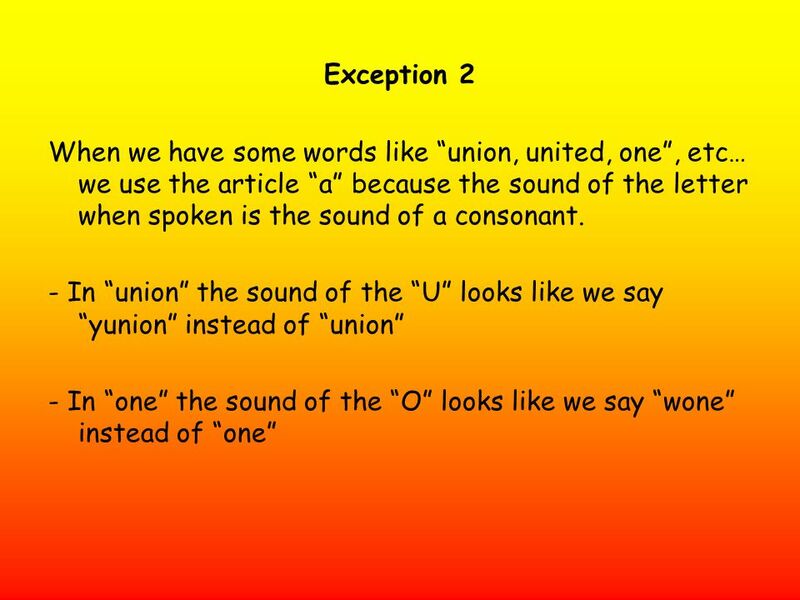 8 Exception 1 When we have a word started by “h” followed by a vowel, when the “h” is unsounded. 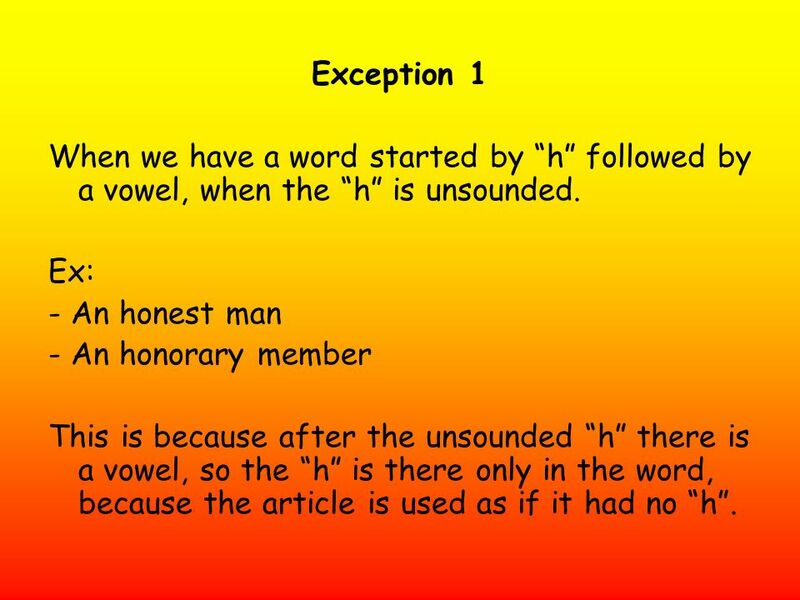 Ex: - An honest man - An honorary member This is because after the unsounded “h” there is a vowel, so the “h” is there only in the word, because the article is used as if it had no “h”. 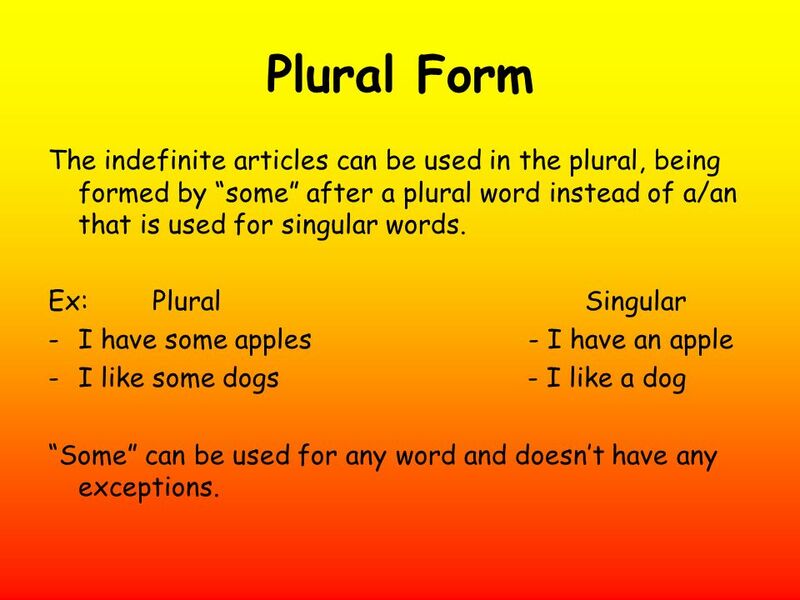 10 Plural Form The indefinite articles can be used in the plural, being formed by “some” after a plural word instead of a/an that is used for singular words. 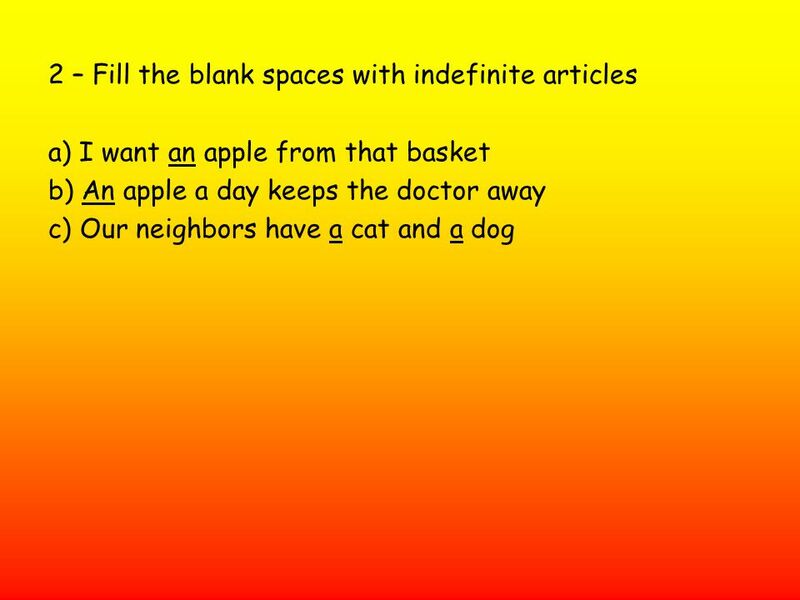 Ex: Plural Singular I have some apples I have an apple I like some dogs I like a dog “Some” can be used for any word and doesn’t have any exceptions. Download ppt "Indefinite Articles a/an"
NOTE:TEACH THE KID THE DEFINITION AND MEANING OF ARTICLE. SINGULAR Singular and Plural. We add a or an before the Singular countable Noun 1- We add a to the nouns which start with consonant letter a book a dog. How do nouns and articles go together? Grammar Toolkit. Nouns 2 Basic Article Usage. Using A or 0 : Generic Nouns A speaker uses generic nouns to make generalizations. A generic noun represents a whole class. 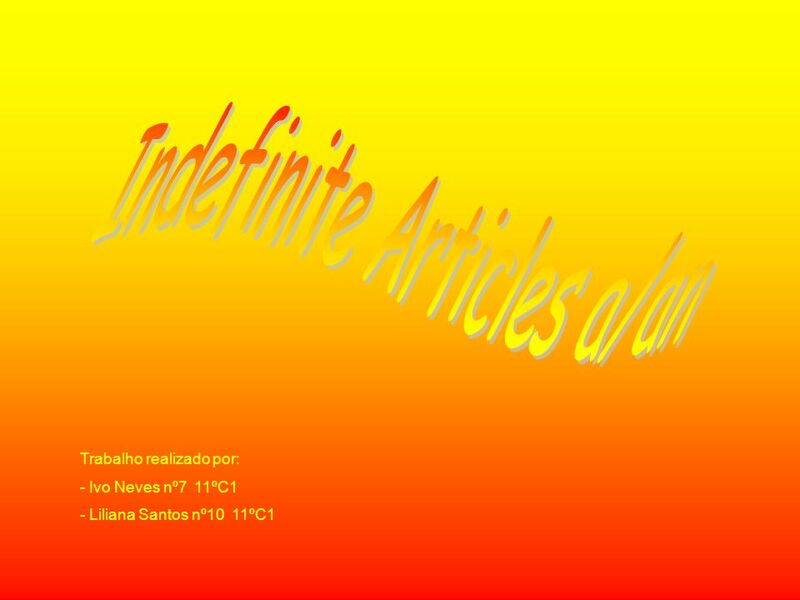 We have two kind of articles: Indefinitea an Definite the. Articles: A, An, and The A Guide for ESL Students. Article Usage: “A,” “An,” and “The”. What is an artcle? An article (abbreviated ART ) is a word (or prefix or suffix) that is used with a noun to indicate. 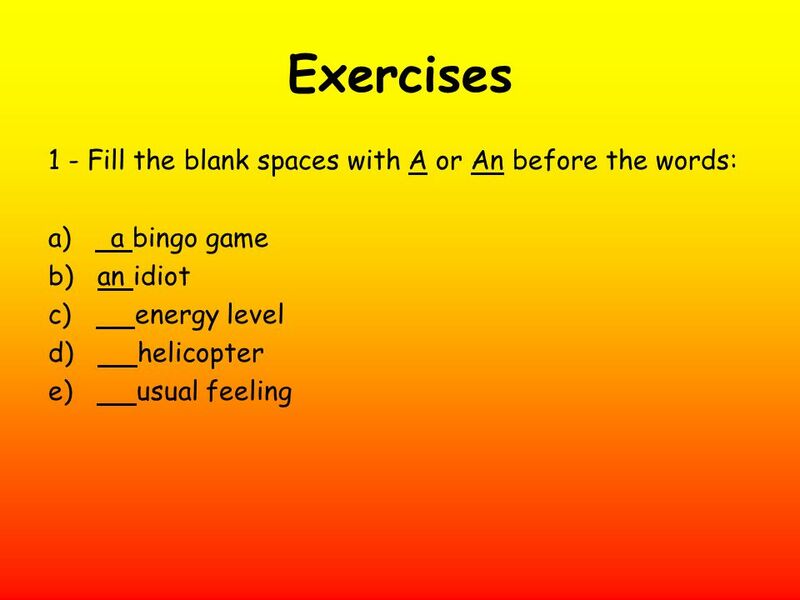 Lessons (Dec. 29, Jan. 5) Articles: A, an, the. The verb estar. The -ar verbs you have used until now are called regular verbs because they follow a regular pattern. Verbs that do not follow a regular. A Remedial English Grammar. CHAPTERS ARTICLES AGREEMENT OF VERB AND SUBJECT CONCORD OF NOUNS, PRONOUNS AND POSSESSIVE ADJECTIVES CONFUSION OF ADJECTIVES. 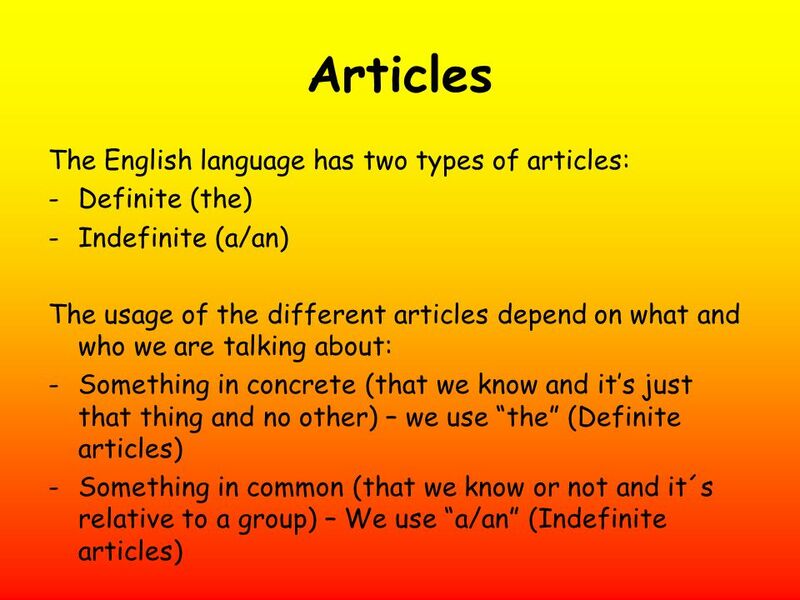 Preparing for the Peer Review Next Class: Definite and Indefinite Articles How do native speakers use them? Articles (a) And (an). Indefinite articles - a and an A and an are the indefinite articles. They refer to something not specifically known to the person.